But orthodontic treatment can also be useful if only a few teeth (like the two upper front teeth) need to be moved slightly. A treatment known as minor tooth movement takes only a few months as opposed to years for traditional multiple teeth movement, and with removable appliances that may use small springs or elastics to place gentle pressure on teeth to move them. So, what constitutes a minor tooth movement scenario? As with any dental condition, the first step is a complete dental examination, particularly the bite. We also need to determine if enough room exists to close any space without compromising the bite with the opposing teeth, and if the teeth and their roots are in a good position to allow minor movement — otherwise, more extensive treatment may be called for. The surrounding gum tissues and bone also need to be healthy and disease-free, especially in adults. We may also need to look more closely at the actual cause for a front tooth gap. If the gap is the result of the tongue habitually pressing against the back of the teeth and pushing them forward, it may then be difficult or impossible to close the gap with minor tooth movement techniques. The cause may also originate from the frenum (a thin, muscular tissue that rises up from between the upper front teeth toward the lip) if it has extended too far between the teeth. In this case we may first need to surgically remove some of the frenum tissue before attempting orthodontics or the teeth may gradually move back apart after closing the gap. Although minor tooth movement normally doesn’t take as long as braces, it may still require several months. And just like with braces, you will need to wear a retainer for several months afterward until the bone stabilizes around the new position. 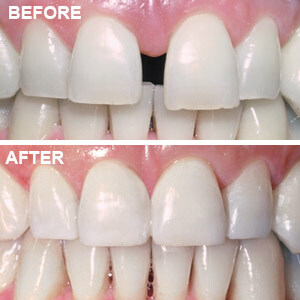 Still, minor tooth movement could have a major impact on your smile.